Throughout the years we have collected several articles from magazines, websites, radio shows and newspapers that have reviewed ASAP Utilities. We're proud to mention that ASAP Utilities is featured in the May 2013 edition of the German magazine ComputerBild (Europe's largest PC and mobile phone-magazine). Gizmo's freeware: This $49 Excel Add-In Is Still Available Free. And It's Better Than Ever. We're proud too tell you that ASAP Utilities was reviewed and recommended (again) by Gizmo's Freeware website today. This $49 Excel Add-In Is Still Available Free. And It's Better Than Ever. 3. October 2012 - 3:17 by rob.schifreen. More than a year ago, I wrote about a great collection of add-utilities for Excel. Since then, the program has continued to improve. It now has more than 200,000 users in 90 countries, and boasts more than 300 new features which it adds to all versions of Excel from 2000 to 2010. The most recent update to the system was just last week. The program is called the ASAP Utilities. As you can see from the screen shot below, all of its features are handily grouped together on a ribbon menu, and the dropdown shows just how feature-packed this program is. If you use Excel, at whatever level, give this program a try. It really does promise to make your life a whole lot easier. It's an 8 MB download from and VirusTotal reports it as free of malware and viruses. ASAP Utilities costs $49 if you use it for commercial purposes. But for home, student and charity use, it's free ot charge. 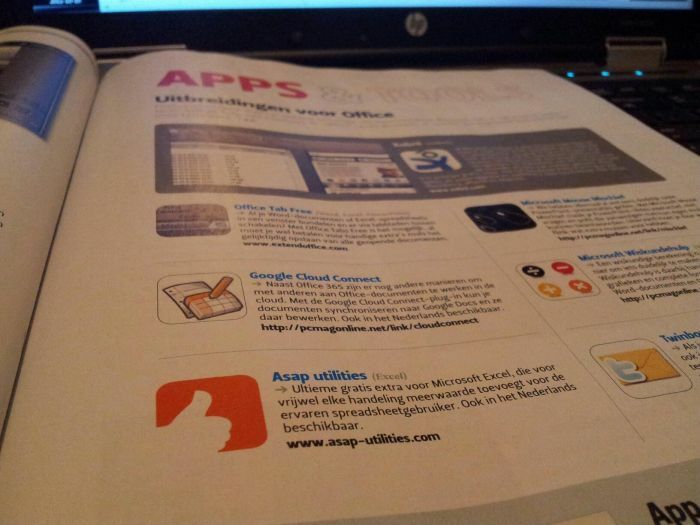 We're proud to mention that the free ASAP Utilities Home&Student edition is featured in the October 2011 edition of the Dutch PC Magazine in an article about apps (addins) for Microsoft Office. English Translation: "Ultimate free extra for Microsoft Excel, adds value for virtually every action for the experienced spreadsheet user. Also available in Dutch." Dutch: "Ultieme gratis extra voor Microsoft Excel, die voor vrijwel elke handeling meerwaarde toevoegt voor de ervaren spreadsheetgebruiker. Ook in het Nederlands beschikbaar". PC World: "The ASAP selection tools alone are enough to turn any Excel power user into an ASAP Utilities addict." 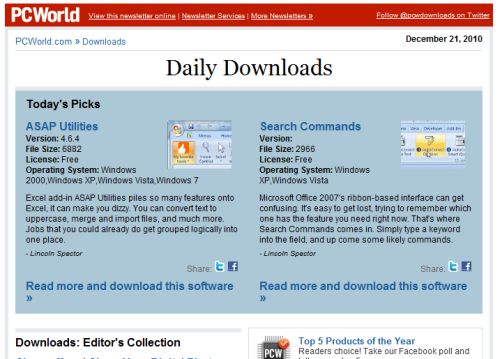 We're proud to mention that ASAP Utilities is among today's picks in the PC World daily downloads newsletter. This way much more people get to know about our the benefits of ASAP Utilities. Work will be finished much quicker, no more overtime and everybody will be home in time to celebrate the holidays with family and friends! C't: "..work becomes easier and faster in the future." C't is one of the most read computer magazines in Germany. In their May edition this year they have made a selection of the best tools for office. We're proud to mention that ASAP Utilities was one of the mentioned add-ins for excel. C't: Let's be honest: No one likes to sit long behind a desk. Bills, bankstatements, correspondence with authorities and all the other trivia are no fun at all. With the Office programs on the Cover-DVD, this work becomes easier and faster in the future. Review in COMPUTER ΓΙΑ ΟΛΟΥΣ: "You will certainly be amazed with ASAP Utilities"
This month, ASAP Utilities is reviewed in the Greek computer magazine COMPUTER ΓΙΑ ΟΛΟΥΣ (Computer For Everyone) and included on the DVD. We’re proud to see what they have written about ASAP Utilities. If you use Microsoft Excel, then you will certainly be amazed with ASAP Utilities. This is an add-on application, which supplements the functions you would like to have in Excel, but do not find there. Created first in 1999 and for ten years continuously developed. By installing, it creates a new menu in the menu bar in earlier versions of Excel or a new tab in the Ribbon in Excel 2007. There are numerous (over 300) features, which expand the repertoire of Excel. The name is an acronym of the words As Soon As Possible and as stated, the purpose is to advance the work of the user. It contains simple and complex functions, which enriches continuously using the feedback obtained from numerous users. Certainly if you start using it, you will discover with time that it has functions that help you tremendously. We're proud to mention that ASAP Utilities was listed as one of the addons; on page 49 and 50. The article has also been published on the German version of Microsoft's MSN.com website. VitaminCM: "Become an Overnight Excel Genius"
In april 2008 the website VitaminCM published a series of articles "Getting the Most Out of Your Applications". In part 6, ASAP Utilities was reviewed. In November ASAP Utilities 4.2.1�was reviewed by ZD Net (Netherlands and Belgium) by Rowald Pruyn. ZDNet.be and ZDNet.nl are two of the best visited and appreciated�ICT-websites in�Belgium and The Netherlands. In april ASAP Utilities was reviewed by the Dutch computer magazine C't. They wrote an article about several additions for Microsoft Office. 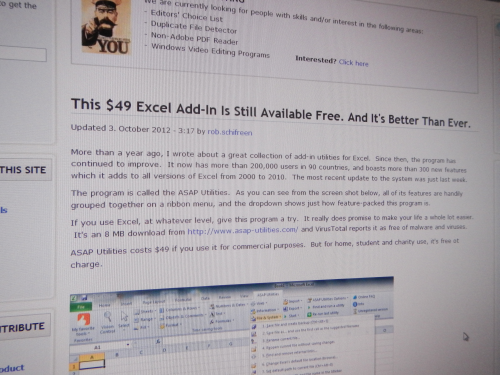 ASAP Utilities was one of the add-ins for Excel they mentioned. Last month the Swiss computer magazine PCtipp wrote an article with 29 useful tips for Excel. ASAP Utilities was one of their tips. They gave it a great title: Obercooles Programm! Since several months ASAP Utilities is listed on The Great Software List. I'm proud, especially when I read their selection criteria. We're proud to mention that yesterday ASAP Utilities has been reviewed by Lifehacker.com and made download of the day! Wendy Boswell: ASAP Utilities gives the user over 300 different Excel utilities and shortcuts to choose from, from Vision Control to Objects. Not being a power Excel user, I'm sure I wasn't able to really tweak this utility to its full potential; however, from what I was able to do with it, I was very impressed. Instead of wasting two hours on, say, trying to figure out how to copy a few formulas without changing their references, you can just use the ASAP Utilities drop-down Range function. ASAP Utilities is a free download, Windows only. In the february 2006 edition of the Swiss magazine PC tipp and article described several add-ins for MS Office: "Office aufgemotzt". We are proud (very proud!) to see a full page was dedicated to ASAP Utilities. Several of the most used utilities were described. Their conclusion: "Kurz: Wenns in Excel etwas gibt, das Sie nervt, st?bern Sie doch mal in den ASAP-Men?s. Fast w?rden wir wetten, dass dort die L?sung f?r Ihr Problem drinsteckt.". Which is someway in English: "In short: When something is bothering in Excel for, take the time to look in the ASAP Utilities menu. We're almost certain the solution for your problem is there." For those new to ASAP Utilities we higly recommend the User Guide, especially chapter 6 which lists comment problems and a description how ASAP Utilities can easily help you to solve these problems. PC Magazine has recently published it's 14th Annual Utility Superguide. We're proud to let you know ASAP Utilities (3.11 beta) has received the PC Magazine 5 Stars Rating (the maximum rating). The judgment is done by a panel of PC Magazine editors, and leading industry experts. ASAP Utilities has been reviewed by Productivity Portfolio a website about productivity and how to use certain tools. Excel is one of the pillars of Microsoft Office. Despite being feature-rich, there are some tasks that are either cumbersome to perform or are buried in the program. That shouldn't stop you from using Excel, as there are some third party tools that nicely complement the program. One example is the free add-in from Bastien Mensink called ASAP Utilities that provides easy access to over 300 utilities. ASAP Utilities is being featured in The Kim Komando Show Cool Site of the Day on August 8, 2005. Kim Komando hosts the largest talk radio show about computers and the Internet. The program is heard on over 450 stations throughout the United States. Kim Komando's newsletter has hundreds of thousands of subscribers. 2005-08-08 | I've used Excel, Microsoft's spreadsheet program, for many years. But sometimes it's not the easiest program to get your arms around. I bet that many business people are probably in the same boat. PC Magazine has recently published it's 2005 Ultimate Utility Guide. We're proud to let you know ASAP Utilities (3.08) has received the PC Magazine 5 Stars Rating, which is selected by a panel of PC Magazine editors, and leading industry experts. This week The Office Letter wrote a review about ASAP Utilities. Every week, they offer tips, tricks, and techniques for Microsoft Office. Learn shortcuts, explore application features, and boost your productivity with hands-on how-to's for Word, Excel, Outlook, PowerPoint, and the rest of the Office suite. PCM is an well read dutch computer magazine. This month they have published an article about extra's for Office. One of the programs for Excel that is discussed is ASAP Utilities. In their conclusion ASAP is one of their favorites. PCM is an well read dutch computer magazine. This month they have published an article about extra tools for Internet Explorer, Outlook and Office. One of the software tools for Excel that is discussed is ASAP Utilities. ASAP Utilities is featured as 'download of the week' on the German website WinTotal, a windows-portal. Die ASAP-Utilities erweitern Excel 2000 aufwärts um über 300 Funktionen, die man sonst nur mühsam selbst oder über Macros erstellen müsste. Die Funktionssuite blendet sich übersichtlich und nach Funktion sortiert in die Menüleiste von Excel ein. So können Sie die Sprache der ASAP Utilities zwischen "Englisch" und "Deutsch" wechseln. Computer Idee is an easy-to-understand dutch computer magazine. 'U vindt in uw lijfblad regelmatig workshops waarmee u in Excel prachtige dingen kunt maken. Vaak wel een hoop werk, maar de moeite waard! Een deel van dat werk kunt u zich besparen dankzij de tip van Martin van Dam. Hij wees ons namelijk op ASAP Utilities, een schitterende verzameling van enkele honderden macro's voor alle Excel-versies vanaf '97. Een macro is een verzameling handelingen die u met één muisklik kunt uitvoeren en dat levert natuurlijk volop tijdswinst op. Terry OConnor - It's been claimed that the most widely used database program in the world isn't a database program - it's Microsoft Excel. That might even be true because Excel is so powerful and so flexible that countless people use it for record-keeping and address books. But Excel's power means myriad functions and they're not always easy to find or use. Which is where add-ons such as ASAP Utilities come in. C't is one of the most read computer magazines in Germany. In their third edition this year they have made a selection of the best tools for Word & Co. ASAP Utilities was one of the three best add-ins for excel. Digi.no has reviewed ASAP Utilities before, a bundle of smart extras for Excel. ASAP is still exanding and now has over 300 functions. The option to desect cells and a number of advanced select functions are only a few of the features. Av Einar Ryvarden - Oslo - Her er en tilleggspakke til Microsoft Excel som gir 300 nye funksjoner. Digi.no har tidligere omtalt ASAP Utilities, en samling med smarte tillegg til Excel. ASAP utvides stadig og er n? kommet opp i 300 nye funksjoner. Muligheten til ? velge bort enkeltceller n?r du har valgt store blokker med musen og en rekke avanserte s?kefunksjoner er noen av mulighetene. 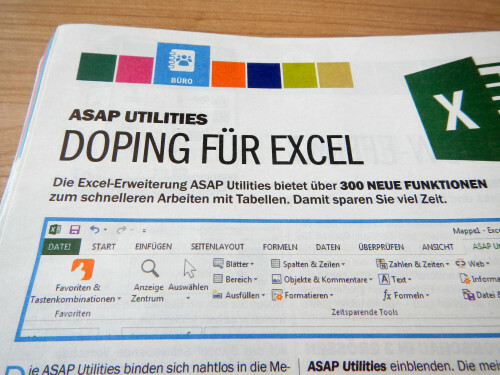 Die ASAP-Utilities erweitern Excel 97/2000/2002 um über 300 Funktionen, die man sonst nur mühsam selbst oder über Marcos erstellen musste. Die Funktionssuite blendet sich übersichtlich und nach Funktion sortiert in die Menüleiste von Excel ein. C't is one of the most read computer magazines in Germany. In their edition 18 they have reviewed several add-ins for Word and Excel. Besides the documentation, which is limited, the review was very positive! Av Einar Ryvarden - Oslo - Her er et omfattende gratis-tillegg til Microsoft Excel som gir deg 300 nye funksjoner og muligheter. ASAP Utilities er et tillegg til Excel 97, 2000 og XP som gir deg en lang rekke nyttig funksjoner og muligheter. Et eksempel er ? kunne velge alle celler med bestemte verdier (fks. st?rre enn 12) eller som har r?de tekst eller bakgrunn. PC Plus: "It's worth having these utilities even if you only use a few of them"
Users of Excel 97 and 2000 may like to download ASAP Utilities from www.asap-utilities.com. This free add-in gives you 200 extra tools for Excel, or 300 in the beta of the new version. It's worth having even if you only use a few of them. In may 2001 Chip Pearson, one of the worlds leading Excel gurus, wrote a review about ASAP Utilities. ASAP Utilities is mentioned on his website as a "must have" add-in for Excel power users. "Created by Bastien Mensink in the Netherlands, this is a fantastic collection of over 200 utilities, all very well organized into a menu structure added to the Excel menu bar. This is truly one of the best and most useful add-ins I've ever used."